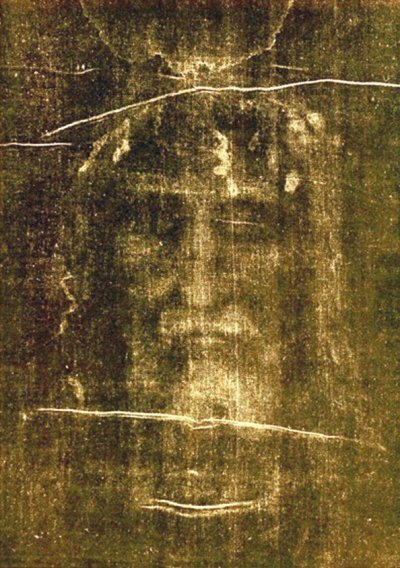 In allowing some images to rise which might help me pull the the threads of the thesis together, the one which most persistently presented itself was that ghostly picture of a man’s head and shoulders which must be the world’s most famous photographic negative – the one which appeared when the photograph taken of the marks on the shroud of Turin was developed. For many people throughout the world, this is a sacred image of the crucified body of Christ, and a central symbol representing the Christian era. Regardless of one’s religious stance, it is not hard to see how this single awe-inspiring one-dimensional image conveys the symbolic essence of what Christianity means. It functions as a kind of spiritual hologram; in itself it is a one-dimensional holographic plate. (ii) But when the light of faith is shone on it, a three dimensional picture – physical, emotional, and spiritual, of what Christianity means, arises for the observer. In contemplating the outcome of the research into the lives of both Mary Shelley and Marc, the idea of the natal Nodal pattern representing a symbolic holographic plate has taken shape. The true turning points in life seem to leap into three dimensions – emotional, physical, spiritual – from the holographic plate on which the basic pattern of the person’s destiny is etched. That pattern is most appropriately carried in the Nodal structure. It holds images of the light of the quest for meaning through the Sun; reflection and containment of that light through the Moon; and grounding in Life’s unfolding process through their orbits’ particular relationship with the Earth’s plane. In every synastry in Mary Shelley’s case; in every key event in both Mary’s and Marc’s lives, running backwards and forwards in time and in the symbolism of all the birth charts, one can see, shimmering through the really critical turning points, the ghostly, but quite distinct holographic plate of both Mary’s and Marc’s natal Nodal patterns. Perhaps that powerful spiritual image of the sacred Shroud arose for me because in reflecting on the meaning of what I had seen at the core of all the different ‘takes’ on the Nodes at work in a range of people’s lives, I felt myself to be in the presence of the numinous, the sacred. I find it impossible to describe adequately my feelings when I realised that in Mary Shelley and Marc’s lives, with each synastry and every major event and turning point, the natal Nodes and their attendant patterns had been painted, not faintly or casually, but in bold primary colours that could not be missed. I had a powerful sense of being in the presence of something ‘Other’ , something which was not circumscribed by the mortality of one individual in one lifetime. I did not expect my research into ‘The Moon’s Nodes in Action’ to present me with such a strong suggestion that we all have our destiny, that certain potent times in life present events and turning points which are initiations into the furtherance of that destiny – or that outwith our lives there may be some intelligent ‘Other’ observing and/or guiding that movement. But that is the feeling which persists in me as a result of this work. I have always reacted with a degree of impatience to the theorising, usually with little empirical evidence to support it, which takes place about the Nodes – now I’m rather more respectful! But it feels good to have done a fairly substantial piece of practical exploratory work demonstrating the theory in action. As the Indian astrologers have been telling us for centuries, the Moon’s Nodes really do seem to be connected to the workings of Fate in the shaping of personal destiny. In this series of posts, I am confining myself to presenting conclusions based on my original research study as described in The Moon’s Nodes in Action: Part One. For readers who need to be brought up to speed regarding the basics, check out Wikipedia on The Lunar Nodes for the astronomy, and Cafe Astrology for a typical explanation of the Nodes’ symbolic meanings. 1) Preface, in which I outlined my personal reasons for becoming fascinated by the Nodal axis and bringing it increasingly into my teaching. 2) Introduction, in which I set out my reasons for embarking on the research. 3) Chapter One: Astronomy and Symbolism of the Nodes. 4) Chapter Two: Case Study One: Mary Shelley, ‘Frankenstein’ and a sheep called Dolly. 5) Chapter Three: Case Study Two: ‘Marc’ (age 51) : a life through the Nodal Lens. 6) Chapter Four: Case Study Three: Four “Nodal Moments” – key turning points analysed in the lives of two men and two women, two famous (Princess Diana and astronaut John Glenn) and two unknown, Anna (age 44) and Andrew (age 34). 7) Conclusions. Finally…. Bibliography, References and Notes, Charts used and their provenance. Transits and progressions weave in and out of life – there may be years for example which are dominated by Pluto, others by Neptune, or very heavily Saturnian years. 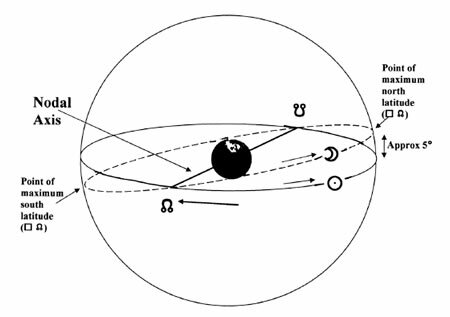 There are the few occasions eg where a planet changes sign by progression, or the MC progresses over Uranus, or the Moon. But there is Nodal activity of some kind going on all the time, as the Nodal axis regresses through the horoscope, transits come to the Natal or progressed Nodes, and progressions touch off the natal Nodal pattern. The Nodes appear to me to function both as witnesses (the Sun) and midwives (the Moon), symbolic translators of the archetypal energies of the planets into the medium of Life as it is lived in the Sun/Moon/Earth system. Where, then, does this leave the contention that Nodal times have a particularily powerful, fateful “charge” to them? That can’t be true of every year in life, surely? If it were, the intensity of it would pretty quickly reduce people to cinders! What, therefore, distinguishes those special moments or turning points in life where either at the time, or later, we realise we have crossed an important threshold? From the research done on Marc’s life in particular, I have concluded that there are two kinds of Nodal activity : major and minor, as it were. As already discussed, there is always some “minor” Nodal activity going on. The really powerful “major” times on the other hand, which are few in any lifetime, are characterised by not just one or two, but a cluster of transits and/or progressions involving the natal, and/or progressed, and/or transitting Nodes. The outer planets, especially Pluto with its strong “fated” feel, stand out. This was an impression I had already formed after 15 years of chart reading – but I’d never tested it out in formal research before. I’m quite clear now, as the Nodal axis regresses through the chart, identifying via the highlighted houses the overall territory up for change, that the transiting eclipses function as “battery chargers”, gradually building up the energies of the person’s life in preparation to receive major change. (i) A very clear example comes to mind from my own life, linked to the Virgo/Pisces eclipse season of Spring 1997-Autumn 1998. In the Spring of 1997 I decided to hire an office out of my home to create space, mainly to write this thesis. My Asc/Desc axis is 9 degrees Virgo/Pisces. 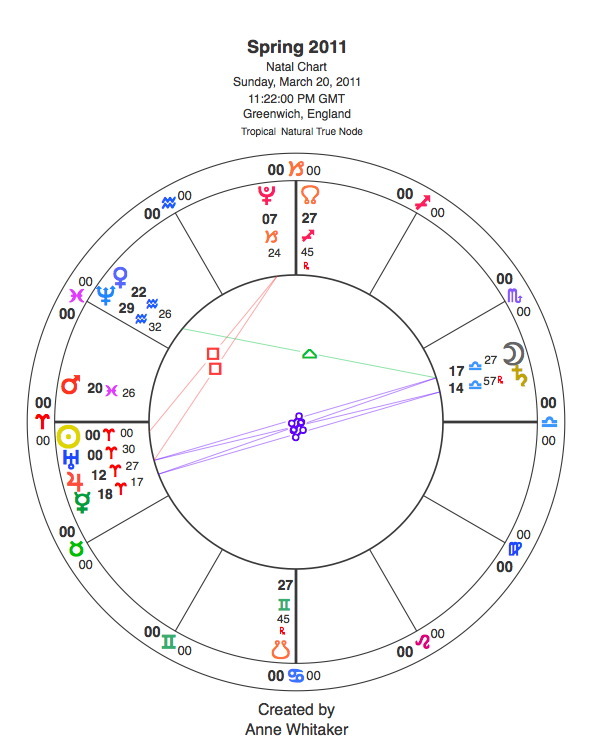 The Virgo/Pisces eclipse season started on 9 March 1997 with a total solar eclipse at 18.5 Pisces, opposite the asteroid Urania at 19 Pisces in my First House, clsely linking in Mary Shelley’s and Marc’s North Nodes at 19 and 21 Gemini respectively. It was at this time that I chose Marc as a main case study subject along with Mary Shelley. On Friday 7 March I saw the office I decided on 10 March to rent, paying for it for a year from an insurance policy I had taken out 18 years previously. At that time, I had a feeling I might need money for a future adventure of some kind – long before I knew anything about either astrology or the 18- year Nodal cycle. My bank manager, of course, thought I was mad…. The middle period of that eclipse season saw me well settled into the writing as the 9 Virgo eclipse fell exactly on my Ascendant in the Autumn of 1997. The following year, the day before the total solar eclipse (7 deg 55 min Pisces) of February 26 1998 fell on the Sixth House side of my Descendant, I had a call from my landlords saying they needed to know by the next day whether I was going to renew my lease, which ran out on 9 May 1998, since the building was being sold. I decided to renew for 6 months and sent my rent cheque off just before the lunar eclipse on 13 March 1998 at 22 Virgo. The lease ran out on 7 November 1998: the day I graduated with my Diploma from the Centre for Psychological Astrology! However, I burned out that obsession during 1997-8 whilst completing the third and final year of my Diploma in Psychological Astrology at the Centre for Psychological Astrology in London, where I had the good fortune to study with Dr Liz Greene and the late, great mundane astrologer, Charles Harvey. How did I do this? By writing a 50,000 word research study called “The Moon’s Nodes in Action”. After that, I’d had enough of the Moon’s Nodes. That was twelve years ago and I moved on to other things. However, in the last week, like everyone else with any interest in world affairs, I have been watching with fascination, horror and a certain excited anticipation of possible positive change as a wave of protest – mainly from the young – has swept the Middle East. The iron grip of dictatorial rulers has been snapping in a domino chain of nations rising in revolt. As the Nodal axis crosses Pluto, approaching the final stage of the August 2009 – July 2011 season of eclipses in Capricorn(North Node point) and Cancer (South Node point) and Colonel Gaddafi loses his grip on Libya amidst scenes of bloodshed and mayhem, I have been prompted to dig that almost-forgotten research study out of its dusty drawer. Having re-read that 1997/8 study, I have decided to publish the final chapter here as a series of posts over the next week or so. I know that many astrologers share my fascination with the Moon’s Nodes: I hope what I have to say will be both interesting and illuminating in its own right. It may also be supportive of what many other astrologers have concluded from their own practice. Guest Slot: ” The woods are lovely, dark and deep….” Sophie Agrell, poet. I have been thinking about woods more than usual in the last couple of weeks. Here in Scotland there have been some recent nights of squally storms: vulnerable trees in my beloved local park have been torn down. There are broken twigs and branches littered over nearby streets. UK – wide protests are gathering momentum as we discover that swathes of our precious woodlands are being sold off to private developers. Locked gates are already appearing round some local woods in England, generating fury amongst nearby residents. My recent encounter with my friend and poet Sophie Agrell was therefore most timeous! She too is a tree and woods lover. She gave me a poem, newly written, about woods. Sophie writes: Knole is a huge seventeenth-century mansion, now owned by the National Trust, set in a 1000-acre medieval deer park in Sevenoaks in Kent. It was the childhood home of Vita Sackville-West and forms the setting for Virginia Woolf’s Orlando. I grew up in Sevenoaks. 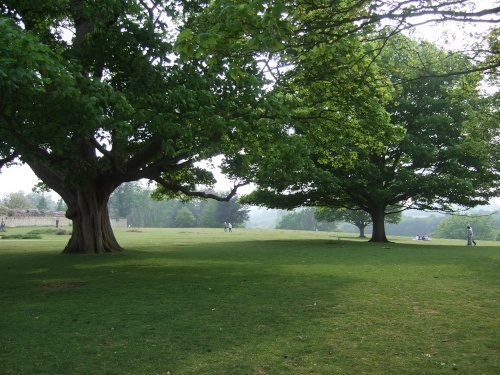 Knole, with its gentle, bracken-covered slopes and woods, unchanged in many ways for 400 years, is my favourite place. Through wind-felled beechwoods yet upright. In drifts of russet leaves, ever crisp. A spring cathedral, roofed with living glass. Tagged "Stopping By Woods on a Snowy Evening", Anne Whitaker/Sophie Agrell 2011, Knole, Knole Sevenoaks Kent, Robert Frost, Sevenoaks, Virginia Woolf’s Orlando. Of the many scary delights of being on the Web, my favourite is never knowing who’s going to turn up! A few weeks ago writer Harry Bingham lightened my January gloom considerably by emailing me with kind words about “Writing from the Twelfth House”. Thus began another positive Web friendship with an accomplished fellow writer. Harry kindly agreed to do a post – this interesting, at times challenging, entertaining and revealing interview is the result. Harry Bingham has written historical fiction for HarperCollins and a couple of books on history and economics. He’s also just sold a new series of crime novels to Orion, and is the author of a bestselling guide to Getting Published. He also runs the Writers’ Workshop, which offers help and advice to first time writers. Anne W: When did you know you wanted to be a writer? Did you tell anyone? If so, whom, and when? Oh gosh, I always knew I wanted to be a writer … at least, ever since I gave up my astronaut / shopkeeper / footballer ambitions. Back when I was ten, a camera crew came to my school to film a short piece about what kids were thinking of as possible careers. Most people said things like ‘policeman’ or ‘nurse’. I said ‘author’. Anne W: How did you go about becoming a writer? What/who were your major influences? Um, well, I became an investment banker first. Not really a conventional path that, but forgive me – I was young. Then my wife got ill, I gave up work to look after her, and wrote my first novel while sitting at her bedside. That book was The Money Makers, and is still one of the best things I’ve ever written. Anne W: Which writers did you love best as a child? Which writers have most deeply influenced you? I loved Sherlock Holmes and CS Forester and anything to do with Greek myth. And then all the classics: I got stuck into Victorian literature pretty early and chomped my way through it avidly. As for influences: I never really know. I think everything influences you to some extent. Even bad novels, you have to understand why they’re bad, why you don’t like them, what you want to do differently. Anne W: What do you think of Ernest Hemingways’s dictum that all writers should have a “built-in, shockproof, crap detector”? It’s essential. Writing’s a funny business. You need a kind of insane optimism to create a novel in the first place. You really do have to love your work and believe it’s great, otherwise you’d never get out of bed. When it comes to the editing, though, you need the opposite mindset: the crap detection one. You just have to go over your material relentlessly looking for the stuff that’s not OK. There’ll be a lot of it about! Anne W: Where do you get most of your ideas from? Do you carry a notebook around to record them? No, and I know writers are meant to do this. I’ve never carried a notebook or anything else. I don’t scribble ideas on napkins. I don’t carry pencils on buses. I just take the dogs for a walk and daydream. Sometimes those daydreams turn into books. I’m lucky that way. Anne W: When should writers seek advice/help from other writers – and when should they just shut up and get on with it? I think most writers need to do both. In the end, you write a book by just sitting at the damn keyboard and writing. On the other hand, it’s terribly rare that a writer can’t learn masses from detailed, tough, constructive feedback on his or her work. I’m a fairly practised writer after all (8 books published, 4 more commissioned) and I get a huge amount from my editor / agent. So I think you need both things: lonely hours, intensive feedback. It’s how nearly all writers operate. Anne W: What has your developmental pattern been toward the stage you are at now? Has it been moderately straighforward or have you done lots of bizarre jobs along the way? I’ve not had any bizarre jobs. I’ve always sold my books for decent money so, unlike many, I’ve more or less been able to support myself from writing. That is rare, however, and I’d urge anyone thinking seriously about writing as a career to give themselves a proper financial fallback plan. Like marrying someone really rich, that sort of thing. Anne W: Have you gained formal qualifications in the art and craft of writing? Is this latter route any great advantage, do you think, in a writer’s development? Why/why not? I’ve got an English O-Level, if that counts. But no: I don’t have any real qualification and I’m not truly a fan of university-level creative writing courses. I don’t think they’re nearly market-driven enough. I don’t think their success record is as strong as it ought to be. I don’t think they’re much good at teaching people how to write genre fiction. But I do think that people will have fun on a creative writing MA course. There are other, better alternatives, however. Our range of online creative writing courses, for example, is deliberately designed so that authors with strong market knowledge and excellent publication records teach the business of writing for publication. That’s, in my view, what nearly all students actually want. Anne W: What inspired you to set up The Writers’ Workshop? Tell us something about it. How long has it been running, and how do you see it developing? I set up the Writers’ Workshop as a way to earn a little extra money when I was between projects. So I built a website, offered editorial advice … and the manuscripts just started to pour in. We’ve now got a team of about 80 novel and other book editors offering tough, professional advice on novels, children’s fiction and most varieties of non-fiction. We also have a policy that whenever we come across material which is strong enough to be marketed, we’ll do all we can to place it with a literary agent. We obviously can’t help everyone through to publication, but we do have multiple success stories, including a number of people who have won literary prizes or become top 10 bestsellers. We also, as mentioned above, run courses. Oh, and we run the annual Festival of Writing. And various other things. You can get the full background by clicking on: The Writers’ Workshop: Your Path to Literary Agents. That my crime novels take off – I’m more excited by these than anything else I’ve ever done. That e-readers are going to kill the books trade. Anne W: Thing you love the most? Bringing a really beautiful book (or six) home from a bookshop. Anne W: Thing you hate the most? When good writers are turned down by cowardly publishers. I HATE that! Anne W: Single best tip? Cut your work by 10%. Then do the same again. Anne W: Thanks, Harry. Great stuff! Come back and talk to us again soon! Get tough, constructive advice on your manuscript. Sign up for one of our writing courses. Come to the Festival of Writing. Join the Word Cloud community. Enjoy our library of Free Advice on agents and writing. Or just get in touch with us. We’re here to help.